That's the first question I asked when I spotted something suspicious in my daughter's hair. What do lice look like? 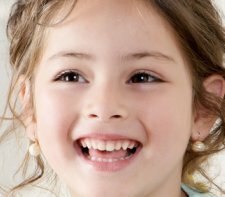 This page contains detailed descriptions, photos and even video of both mature head lice and nits. Head lice are gray or brown, and may appear either light or dark in color. They're tan, dark gray, and every shade in between. 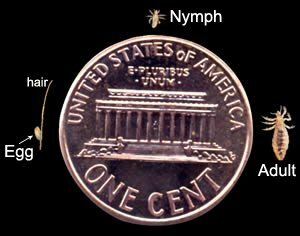 The full-grown lice are between 2 and 3 millimeters long (about 1/8 of an inch). Actual size of the creature? Remember, they often escape notice for quite a long time. Check out this graphic from the CDC. Sometimes when you first examine a child's head, you won't see any moving lice right away … they're fast! But you can check near the scalp for nits, which stay in one place. It's easy to confuse nits with dandruff flakes or bits of lint. Here's how to tell the difference … if you can flick or pick the particle off easily, it's not a nit. Nits are attached to the hair very strongly. Usually you can only remove a nit by pulling it all the way down and off the end of the hair strand. The first image below is a CDC photo of an unhatched nit. You can see the angle at which nits are attached to a hair strand. The next two images are also astonishing photos from the CDC, taken with a powerful microscope, which actually show a louse about to hatch, and a louse hatching! Come to think of it, I'm glad we can't see all that detail when we're actually dealing with nits. Remember, you're looking for teeny light-colored ovals, attached securely to the hair near the scalp. Got lice or nits? Don't panic. They're really not that difficult to deal with, once you know how to treat head lice. So now you can answer the question "What do lice look like?" You're in good company. Few parents get through the child-rearing years without having to deal with this question!